The traditional warm spices that flavor pumpkin pie may not belong in everything, but they happen to be very well suited to this crunchy granola made of oats, nuts, and seeds. Preheat the oven to 300°F. Lightly grease (or line with parchment) a 13" x 18" rimmed baking sheet. In a large bowl, stir together the oats, pumpkin seeds, pecans, flaxseeds, and dry milk. In a medium bowl, stir together the pumpkin, brown sugar, oil, salt, and spices. 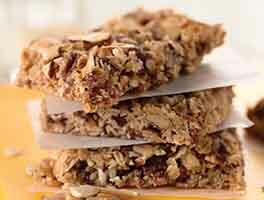 Pour the pumpkin mixture over the oat mixture and stir until the granola is evenly moistened. 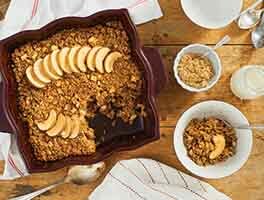 Spread the granola out on the prepared baking sheet and bake for 90 minutes, stirring every 15 minutes. Remove from the oven and let cool completely. 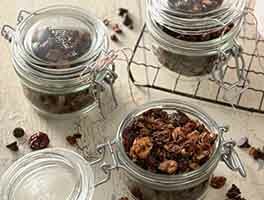 Pour the granola into a large bowl and mix in the raisins and crystallized ginger. Transfer to an airtight container to store at room temperature for up to 2 weeks, or in the freezer for up to 3 months. If you're eating gluten-free, make sure you reach for certified gluten-free oats for this recipe. For a vegan version, omit the dry milk and replace it with an equal amount of seeds or some nutritional yeast instead. 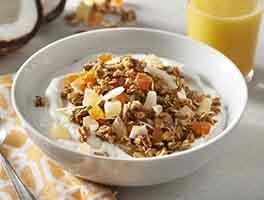 I love all things pumpkin and this granola is no exception! I think this will now be my favorite granola recipe. I followed the recipe almost exactly since I wanted to review it. It is not helpful for reviewers to change so much on a recipe and then give a negative review. The only change I made was to add just a little chopped dates instead of raisins (since I do not care for raisins) and only a small amount of crystallized ginger. The spices are excellent, although I think they could be doubled and still not be overpowering. 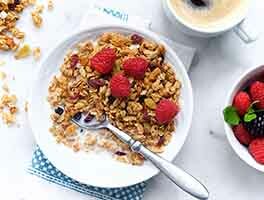 I had homemade yogurt sweetened with maple syrup and sliced strawberries along with this granola and it was a delicious breakfast!